We know that families have many familty dentist options available to them in the Tallmadge, Stow, and Munroe Falls communities. We’re honored you’ve decided to trust Dr. Evan, Dr. Bartels, and team at Munroe Falls Family Dentistry with your oral health! As a welcome gift, we’d like to offer you either a complimentary at-home professional-strength whitening strip system or an Oral-B Vitality Toothbrush. If you’d like to take advantage of this offer, you can print the coupon and bring it with you when you come for your first cleaning and exam with X-Rays appointment. If you don’t have a printer, simply show this offer on your smartphone to our front team members when you check in for that first appointment. This new patient offer has a limit of one per household, please. Feel free to pass this link on to extended family and friends, though. 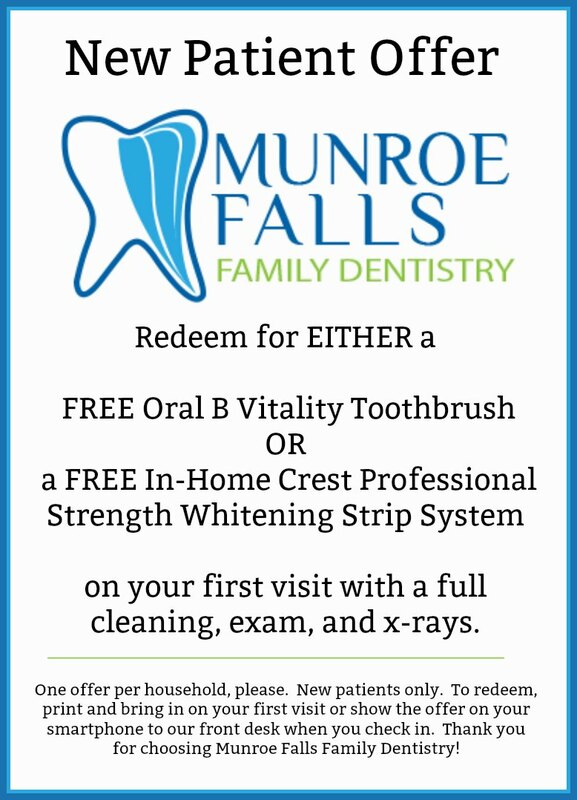 Munroe Falls Family Dentistry is conveniently nestled between Stow, Ohio and Tallmadge, Ohio.